BRUSSELS — After a series of decisions by President Trump that have split the trans-Atlantic alliance, European foreign ministers have begun a scramble to contain the fallout to their own interests, global institutions and stability in the Middle East. But even the initial steps of Europe’s effort to devise a separate strategyand save the nuclear accord with Iran showed that the allies might now be working at cross-purposes with the United States, further straining years of international consensus. The Europeans — as well as the cosignatories Russia and China — want Iran to continue to abide by the deal, which is considered a signal accomplishment of European diplomacy. It sharply restricts Tehran’s ability to enrich uranium to prevent the development of a nuclear weapon. To preserve the deal, the Europeans are trying to figure out ways to provide some of the economic benefits it promised Iran, which are threatened now with the renewal of tough American sanctions. Their efforts come against the backdrop of Gazans being shot in large numbers in demonstrations tied to Israel’s 70th birthday and Mr. Trump’s decision to move the United States Embassy to Jerusalem — another move made in the face of European opposition. The Europeans have also emphasized their disagreement over the embassy move. Ms. Mogherini said Europeans would continue “to respect the international consensus on Jerusalem” and not move their embassies until the city’s final status was resolved in a peace treaty. Ian Bond, foreign policy analyst with the Center for European Reform, argued that “Europeans and Atlanticist Americans must preserve what they can of the trans-Atlantic partnership” while Mr. Trump is in office. “But he is doing a lot of damage in the meantime — not just hurting allies, but actively helping potential adversaries,” he said, pointing to the Iran deal pullout, the Jerusalem embassy and unilateral tariffs on steel that harm Europe. Indeed it was. In their meetings with Mr. Zarif, the foreign ministers were preparing for broader discussions among European leaders Wednesday night at a meeting in Bulgaria, which was supposed to center on outreach to the six nations of the Western Balkans. Ms. Mogherini said that the three European countries that helped negotiate the Iran deal would stay with it as long as Iran did. “We will save it together,” she said. On Tuesday night, after the meeting, Ms. Mogherini said that the foreign ministers had agreed to begin work, to “find solutions in the next few weeks,” on issues like Iran’s energy sales, banking transactions, export credits and investment, and protections for European companies working in Iran. But preserving or increasing European investment in Iran in the face of the American sanctions is a difficult challenge — especially since the White House has made clear to Europeans that their companies will not get exemptions from the sanctions, which Washington hopes will pressure Iran into a new set of negotiations. It was an irony that escaped few European officials: They were trying to find ways to ease the economic pressure on Iran and keep it in the nuclear deal, while Washington was trying to increase that pressure for unclear ends. Many Europeans, like Ms. Tocci, believe that the unstated American aim is “regime change” in Iran, something that the British and French foreign ministers, Boris Johnson and Mr. Le Drian, have specifically ruled out as a European goal. These same foreign ministers once spent weeks trying to toughen sanctions on Iran over its ballistic missile program and its support for groups like Hamas and Hezbollah to please Mr. Trump and get him to agree to stay in the nuclear accord. Now they have dropped all such attempts. Instead, they were working to keep Iran in the deal at all and find ways to compensate Tehran for doing so. While Mr. Trump’s national security adviser, John R. Bolton, has said that the American intention is to force Iran into new, broader negotiations, European officials said they had heard no American strategy for doing that. European diplomats, speaking on background because they did not have authorization to talk otherwise, said on Tuesday that they felt no great urgency, which was just as well, given the difficulty of the task. They had the impression, they said, that Iran wants to remain in the deal so long as the government can show benefits to the population, and of course to avoid a more open confrontation with Washington. The Europeans will try to uphold their side of the bargain, one senior European diplomat said, but it will be very difficult to preserve the economic benefits for Iran. For all the talk about so-called blocking regulations to protect European companies from American sanctions and the possible use of the European Investment Bank to provide euro-based financing for deals with Iran, there was little optimism that these solutions would work very well. Many European companies that have invested in Iran — or might want to — also do business in the United States, a much more important market, and are unlikely to want to test the American sanctions. 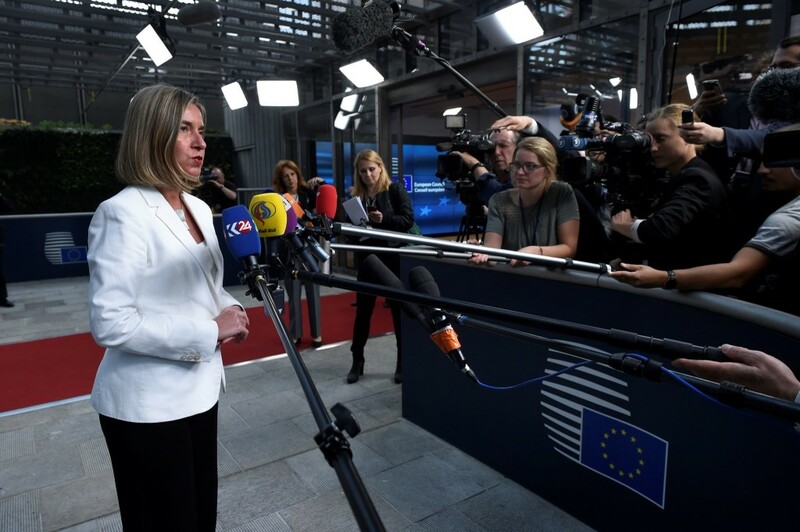 Nor do the Europeans want competition with the United States, which is still Europe’s most important ally and partner, to tip into confrontation, as Ms. Mogherini has said. That is especially important for Britain, which is leaving the European Union and wants Washington’s support. As the Europeans met with Mr. Zarif, elsewhere in Brussels the American chairman of the Joint Chiefs of Staff, Gen. Joseph F. Dunford Jr., was meeting with NATO allies to discuss Afghanistan and European security. For all Mr. Trump’s criticism and even misunderstanding of NATO, and his admiration for President Vladimir V. Putin of Russia — who opened the first bridge on Monday between Russia and Crimea, which he annexed from Ukraine — the United States has beefed up its military commitment to NATO and its members bordering Russia. While NATO had no role in the Iran deal, the three European nations trying to preserve it are also Washington’s most powerful allies in NATO. But Europeans, in general, feel that the fundamentals of the trans-Atlantic partnership are all under threat from Washington. That can only help countries like Russia and China, which seek to undermine the current world order. It is less clear what she and other Europeans are willing to do about it.